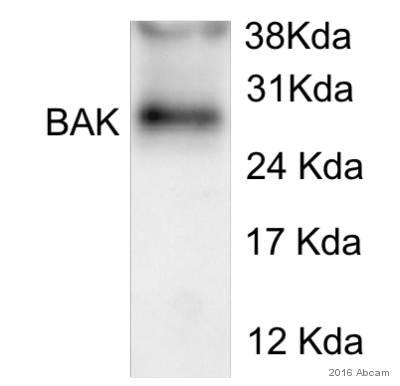 Recombinant fragment corresponding to amino acids 29-187 of Human Bak, purified from E. coli. WB: Mouse lung lysate, 293T, HeLa, A431, A549, Jurkat, MCF7, and PC3 cell lysates ICC/IF: HeLa cells. FC: HeLa cells. Our Abpromise guarantee covers the use of ab104124 in the following tested applications. WB Use at an assay dependent concentration. Predicted molecular weight: 23 kDa. In the presence of an appropriate stimulus, accelerates programmed cell death by binding to, and antagonizing the anti-apoptotic action of BCL2 or its adenovirus homolog E1B 19k protein. Low micromolar levels of zinc ions inhibit the promotion of apoptosis. Expressed in a wide variety of tissues, with highest levels in the heart and skeletal muscle. Lanes 1 - 2: Merged signal (red and green). Green - ab104124 observed at 0 kDa. Red - loading control, ab181602, observed at 37 kDa. ab104124 was found to be non-specific when BAK knockout samples were used. Wild-type and BAK knockout samples were subjected to SDS-PAGE. Ab104124 and ab181602 (Rabbit anti-GAPDH loading control) were incubated overnight at 4°C at 1/250 dilution and 1/20000 dilution respectively. Blots were developed with Goat anti-Mouse IgG H&L (IRDye® 800CW) preabsorbed ab216772 and Goat anti-Rabbit IgG H&L (IRDye® 680RD) preabsorbed ab216777 secondary antibodies at 1/20000 dilution for 1 hour at room temperature before imaging. Flow cytometry analysis of BAK in HeLa cells. The cell was stained with ab104124 at 2-5µg for 1x106 cells (red). A Goat anti mouse IgG (Alexa fluor 488) was used as the secondary antibody. Mouse monoclonal IgG was used as the isotype control (blue), cells without incubation with primary and secondary antibody was used as the negative control (black). Immunocytochemistry/ Immunofluorescence analysis of BAK in HeLa cells. 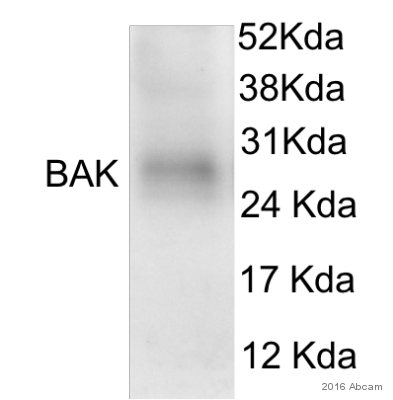 The cell was stained with ab104124 (1:100). The secondary antibody (green) was used Alexa Fluor 488. DAPI was stained the cell nucleus (blue). Immunofluorescence staining of Bak in HeLa cells using Hoechst 3342 (Blue) for nucleus staining and ab104124 antibody (1/500) with Texas Red (Red). Publishing research using ab104124? Please let us know so that we can cite the reference in this datasheet.